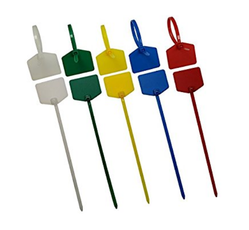 Prominent & Leading Wholesale Trader from Mumbai, we offer custom medical gas duromark pipe markers, normally open valve tags, write-on tie tags, write-on jumbo tie tags, heavy duty rectangular plastic tags and fire protection water valve tags. Color Red, Yellow, Green, Grey, Orange, Brown or Blue. 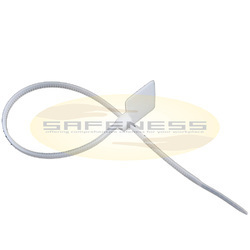 Used for labelling of Pipes with exact words and symbols which is required to make it safe. It consists of a self-adhesive vinyl marker which includes your custom wording printed 4 times on each marker indicating flow. 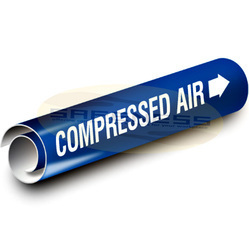 It follows the Compressed Gas Association Standard: (CGA) C-9-1988(R1993). 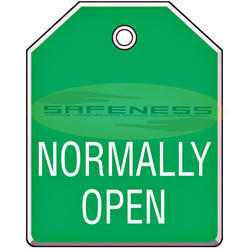 Normally open valve tags are used to prevent accidents during valve adjustment . It indicates that the valve is open normally. These normally open plastic valve tags identify valves with popular wordings that are easily understood by workers. These are plastic made two-sided permanently locking write-on tie tags. They are tamperproof and remain on pipes until removed manually. Write-on area features a permanently-locking pull-snug fastener. It is tamperproof and remains on the pipe until manually removed. The Large write-on area allows you customize your message.It also features a permanently-locking pull-snug fastener. Permanently mark the write-on area with important information using a black permanent marker. Feature Thick and Tear proof. It comes with metal grommets. The information can be easily filled on pre-printed lines (lines on 1 side only). The Fire protection water valve tags show valve status in a way that is easily readable by the employees from distance. 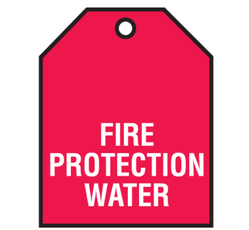 These engraved plastic fire protection water tags help to identify valves with popular and easily understandable wordings. It helps in preventing accidents during valve adjustments. Resistance Dirt,grease,grime, weather and harsh plant conditions. Duromark pipe markers are available in rolls and offer big savings. 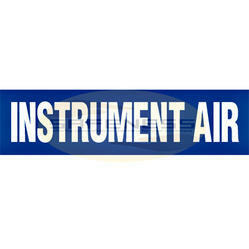 This Duromark pipe markers on-a-roll state: "INSTRUMENT AIR." The word/sentence is written in white on blue strip. It is resistant to dirt, grease, grime, weather and harsh plant conditions. It can be easily passed by Simply peeling and then press firmly onto a clean pipe. Size 1" x 3" / 2" x 3"
Resistance Adverse Conditions Like Dirt, Grease, Grime, Weather And Harsh Plant Conditions. Red pipe markers with white arrows point out pipe content's direction of travel so that it is possible to identify the direction of fluid flow within the pipe. These directional pipe markers are resistant to adverse conditions like dirt, grease, grime, weather and harsh plant conditions. Design Duromark pipe markers on-a-roll state: "SUPPLY." Resistance Dirt,grease,weather and harsh plant conditions. Supply Duromark pipe markers are used to indicate the supply pipe or duct so as to make its identification easier. Duromark pipe markers on-a-roll state: "SUPPLY." It is resistant to conditions like dirt,grease,weather and harsh plant conditions. Simply peel and press firmly to a clean pipe. Sold in rolls of 72 Duromark pipe markers. Color is black on yellow. Feature Dirt,grease,weather and harsh plant condition. 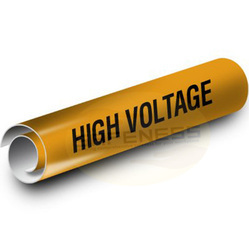 220 Volts Duromark Pipe Markers are used to indicate the 220 volts electric supply in the pipe for its identification. 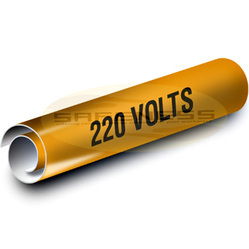 The roll states "220 VOLTS." It is resistant to conditions like dirt, grease, weather and harsh plant condition. Color is black on orange. Design Clean pipe, peel backing and press firmly in place. 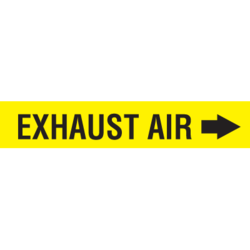 Duromark pipe markers on-a-roll are convenient and ideal for large projects. It is Easy to install: Clean pipe, peel backing and press firmly in place. Overlaminate shields against dirt, grease, grime, weather and harsh plant conditions. Available Color is white on blue. 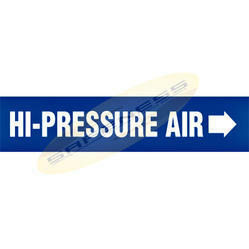 Wording on Roll is "HI-PRESSURE AIR". Resistance Dirt, grease, grime, weather and harsh plant conditions. 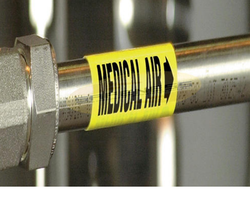 Duromark pipe markers on-a-roll are available in rolls for the ease of the use. Duromark pipe markers on-a-roll reads: "SANITARY SEWER." Resistant to dirt, grease, grime, weather and harsh plant conditions. Color is white on green. 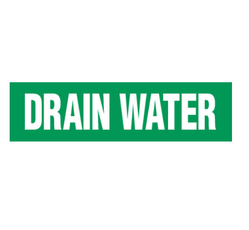 Design Designed With Wording And Arrow Repeating 65 Times Per Roll Every 5-1/2"
Wrap-around pipe markers are supplied for easy application and cost savings. It is used to identify the drain pipe. 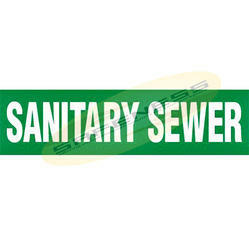 Wrap-around self-adhesive drain pipe marker reads "Drain" with white colour on the green background. Pressure-sensitive vinyl overlaps and adheres to itself for a secure fit without arrow tape. Designed with wording and arrow repeating 65 times per roll every 5-1/2". Design Wording On The Roll Are Repeated 65 Times Per Roll Every 5-1/2"
Wrap-around pipe markers are used for easy, self-stick application. 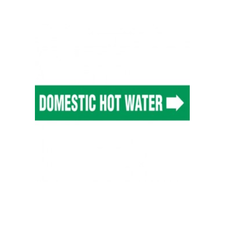 The Wrap-around self-adhesive domestic hot water pipe marker reads Domestic hot water with white colour on green strip. Pressure-sensitive vinyl overlaps and adheres to itself for a secure fit without arrow tape. Working on the roll is repeated 65 times per roll every 5-1/2". Feature Flexible yet durable for high performance and resists dirt, grease, and moisture. Matter type Caution, Danger etc. Danger self-fastening tags show a danger sign and allow a message to be displayed in the header. These tags are flexible yet durable for high performance and resist dirt, grease, and moisture. 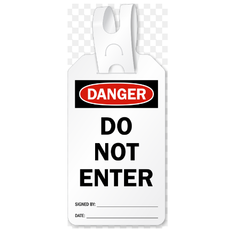 White danger tags are sold in packages of 25 and include a permanent black marker. 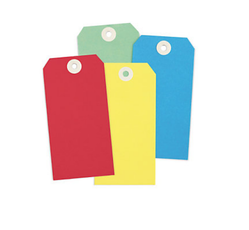 The Numbered 1-25 write-on tags feature pre-printed consecutive numbering and a space for your text. These numbered write-on tags are used for labelling equipment in plants and warehouses. The numbers are Bold, easy to read and stand out against the background. 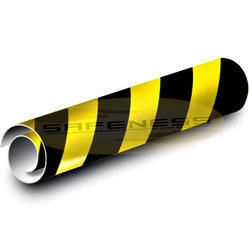 The gas pipe marker is used to mark the gas pipes so as make it simple to identify it. Pressure-sensitive vinyl with adhesive backing permanently marks pipes in one, quick application. 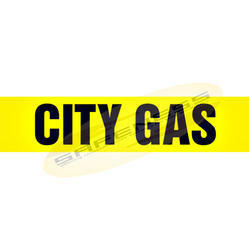 Marker reads City gas in black color on yellow background. Color White Color On Green Background. In-stock Denmark economy pipe markers are the most economical way to label indoor pipes. The Pipe markers securely identify contents of pipes without falling off! 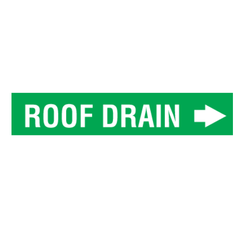 Marker reads as Roof drain with white colour on the green background. Usage Used to show the direction of pipe or the direction of flow of fluid inside the pipe. 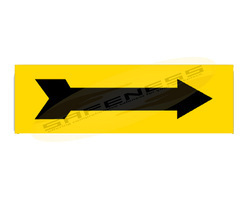 The Arrow pipe markers are extensively used to show the direction of pipe or the direction of flow of fluid inside the pipe. Pipe markers securely identify contents of pipes without falling off! Feature The Hot Pipes Can Be Easily Marked Using This Label So That The Workers Can Easily Identify It. 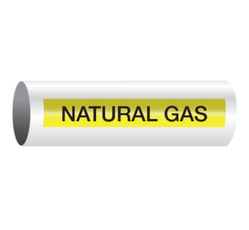 The hot pipes can be easily marked using this label so that the workers or employees can easily identify it. Color-coded duct markers are used to keep air system organized. It help the workers track the source and direction of every exhaust air duct in the facility. Dimension 7" x 10", 10" x 14", 14" x 20"
The emergency Shut-off Sign Marker is used to locate the emergency valves by the workers or the employees. 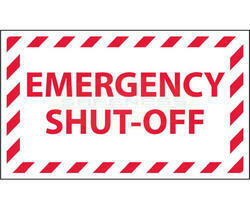 The wording is "EMERGENCY SHUT-OFF" written with red color. Design Kwik-koil Pipe Markers Can Be Easily Snap Around Pipes. These Kwik-Koil pipe markers can be easily snap around pipes. Tapes or Messy Adhesives are not required as it is precoiled. Printed with arrows to indicate direction of pipe contents. UV-resistant ink is fade-proof for 5-8 years outdoors. Provides INDEFINITE life when used or STORED in temperatures 70°F. The high-quality Kwik-Koil pipe markers are made in such a way that it can be easily snap around pipes. Precoiled to snap securely in place without tape or messy adhesives. It is highly durable when used or STORED in temperatures 70°F. Kwik-Koil pipe markers easily snap around pipes. They are Precoiled to snap securely in place without tape or messy adhesives. Provides INDEFINITE life when used or STORED at temperatures 70°F. 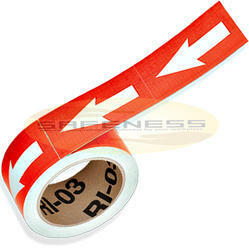 Pipe arrow banding tape is self-adhesive tape and can be used on dirty or rough pipes. To protect the ape from extreme plant or weather conditions it is laminated. A magnetic number is used to keep a track on information like accident-free days. Magnetic numbers are perfect for steel safety scoreboards. Design Each character has self-adhesive backing. 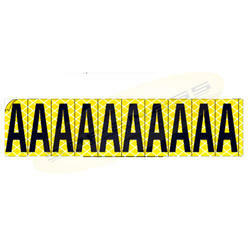 The high-quality Self-adhesive vinyl letter and number set labels include 1 of each letters A-Z and 0-9. When cards of multiple numbers and letters are unnecessary, individual vinyl characters give you the versatility you need. It can be used indoors or outdoor for locating, identifying and organizing items in your facility. Each character has a self-adhesive backing. Resists dirt, grease and abrasion. Black characters on yellow or white labels. 1" Vinyl Alphabet Packs contains multiple characters for the immediate use. A Vinyl letter sets come as 260 letters per pack. 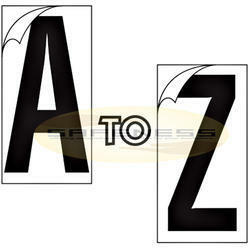 The Alphabet packs contain 26 cards: 1 card with multiples of each letter A-Z. These Self-adhesive vinyl letters are durable and adhere to any surface. Organized in booklets to make storage and access easy. 1" letter on a 1-1/4"h x 5/8"w label. 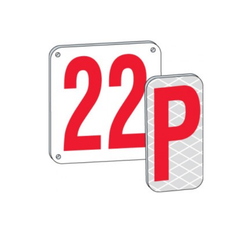 Size (in inch) 7" x 4" or 7" x 8"
These Non-reflective aluminium plates are perfect for gates, barriers, buildings, or other areas. Available in 2 sizes: 7" x 4" or 7" x 8". Plates are white with 6" red characters. Available numbers are 0 to 99 and letters A to Z. It has a provision for mounting with holes for secure installation. 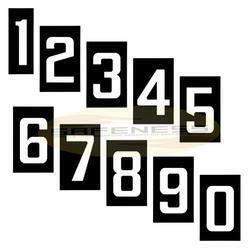 These reflective identical numbers and alphabets are highly used for identification when the light is low. They appear normal under natural light but shines brightly when struck by a beam of light. 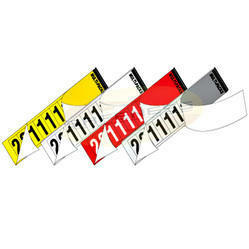 Reflective yellow identical number or letter labels come in 3 sizes and with black characters. The identical number and letter labels make it easy to select the characters you need without having to order complete alphabet or number sets. 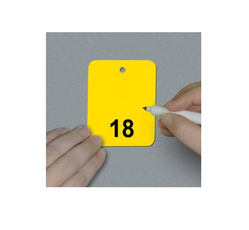 Self-adhesive for specific identification of doors, machinery and more. Durable for indoor or outdoor use. Sold in card-form for easy application and storage. 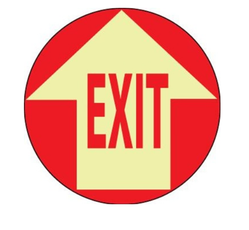 Exit floor decals floor markers are used for the indication of exit areas and help protect from falls in your facility. It has durable, non-slip Lexan coating which resists chemicals and solvents. Graphics are subsurface printed to withstand abuse from pedestrians and lift trucks. These floor markers maintain a longer life than standard floor markers as it doesn't chip or crack. Available in 24" Dia. or 17" Dia. 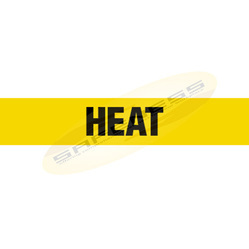 Temp Range -40 degree F to 176 degree F.
Cold Adhesion Anti-Slip Floor Markers is a category under Floor Markers that is specially designed for use in cold areas like freezers, unheated warehouses and even outdoors. 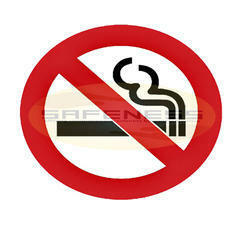 Floor markers feature a No Smoking symbol. Subsurface printed to resist wear and tear. Warehouse floor marking comes with non-slip coating to protect against slips and falls. Available in three materials: anti-slip vinyl, cold-adhesion vinyl, and heavy-duty lexan topcoat. Available in three sizes: 7-1/2” dia., 17” dia., and 24” dia. Can be applied to surfaces down to 0°F. Service temp range is -40°F to 176°F. Floor signs securely bond to surfaces under 50°F. "Be Alert High Traffic Area "
"Our Aim No Accidents "
"Fire Exit Keep Clear At All Times"
These stencils are used to create professional-looking messages again and again. Use with Floor Marking Paint (sold separately). 17" image can be made on 24" x 24" stencils. 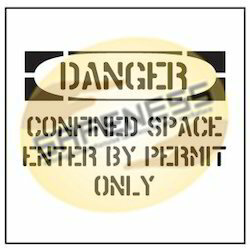 "Danger Confined Space Enter By Permit Only"
Applicable Machine Type Indoor and outdoor applications. These tapes are made with Durable vinyl and with a strong adhesive which will stick to irregular, curved, rough or textured surfaces. 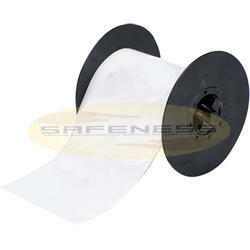 Vinyl printer tapes can be used for both indoor and outdoor applications. 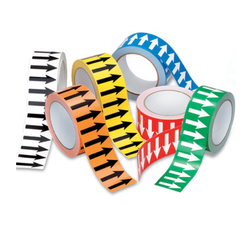 Tapes measure 100' in length and come in 0.5", 1.13", 2.25", 3", and 4" widths. Available in colors: black, blue, brown, gray, green, orange, purple, red, yellow, white, and magenta. Design Indefinite Life When Used Or Stored In Temperatures 70 Degree F.
Kwik-Koil pipe markers can be easily snap around pipes. The marker features black and yellow stripes. The UV-resistant ink does not fade for 5-8 years even if it is kept under the sun. Looking for Warehouse Marking And Identification ?